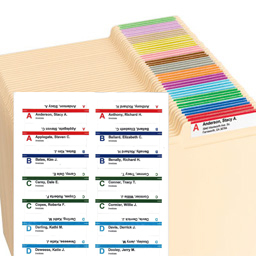 Windows-based software allows you to create unique labels for folders or hanging folders. Hanging folder labels attach to specially designed and patented 3-sided Viewables hanging folder tabs. The labeled tab allows the user to read the label from the front, top or back. Please click here for the new Viewables.com online label creator. A valid email address is required to download the free software. By registering you will receive product updates and information by email. In a few minutes you will be sent an email containing the download instructions. In Windows Explorer, go to the location where you saved the downloaded file, double-click the file to start the installation process, and then follow the instructions. The downloaded file is a self-extracting executable (.exe) file. By running the file, you install the program and documentation on your computer. Windows 8, 7 SP2, XP SP3 or Windows Server 2003 with SP1, or Windows Server 2008 or 2008 R2.